Jonathan Safran Foer’s Eating Animals, is a moving chronicle detailing how fatherhood inspired him to investigate the American food system first-hand before deciding what nutritional choices to embrace for his firstborn. Rather than being a pro-vegetarian polemic, Foer’s book celebrates the power of storytelling to make sense of the choices we make, the traditions we continue to honor or reinvent to suit the needs of a new day, and the information we choose to forget in order to get on with our lives. His overarching thesis is that cruelty is woven into the very fabric of the global meat industry, from the mistreatment and crowded conditions cattle, pigs, chickens and other farmed animals endure in the massive compounds where they are born and raised, to the unspeakable discomforts of being shipped across country, fattened up for the kill, and then slaughtered by the thousands every day. The novelist advocates a vegetarian eating lifestyle as the only way to opt out of a cycle of pain, cruelty and death that otherwise fuels our own daily toil. New York Times food writer, Mark Bittman, is another strong voice decrying the evils of the Standard American Diet or what he calls “SAD,” which promotes the consumption of processed food at every turn. Like Foer, Bittman states in his popular TED talk, “What’s Wrong with What We Eat,” that the industrial, factory farm system that provides the nation’s animal protein supply is so corrosive to the environment, that anyone who is concerned and trying to do something to reverse the ecological damage mankind has already wrought (he uses Prius drivers as their emblematic representative) should do his or her part by eating mostly plants, without having to give up meat altogether. Mr. Bittman advises those same consumers to purchase only organically raised, grass-fed beef, though he does acknowledge that the label “organic” loses all its meaning when applied to the kind of feed given to creatures not meant to consume it in the first-place, like farmed salmon who grow up on organic soy meal, for example. Though his TED talk does not mention his daughters, Bittman recently posted an article in which he explained his approach to feeding his children when they were young and lived at home: by exposing them to a wide variety of home-cooked meals featuring fresh ingredients. As adults, they are adventurous eaters and capable home cooks in their own right. As a mother myself, I wonder what Mr. Foer’s and Mr. Bittman’s reaction would be to the obscene toy I saw advertised on cable TV this afternoon, as I checked in on my 8 year old son’s TV watching. Thankfully, it did not catch his interest, but it certainly got my attention. Everyone takes turns to roll the die to see how many chomps the pig will take. Push down the pig’s head to chomp the burger. With every pump, the pig’s stomach will get bigger, bigger, and bigger. But don’t feed him too much because if he pops, you lose! First, it celebrates mindless gluttony, one of the seven deadly sins. Granted, this alone is not new. I received a “Hungry, Hungry Hippo” game in the early 1980s, and it was a lot of fun to play. However, the idea behind the “Hungry, Hungry Hippo” was to beat your opponents at the abstract task of amassing the largest possible number of white marbles which the hippos gathered by “eating them” by opening their large mouths assisted by a lever one frantically hit. Competitive greed was at the heart of this exercise, but the marbles themselves were largely symbolic—they did not resemble any recognizable food source in the least. 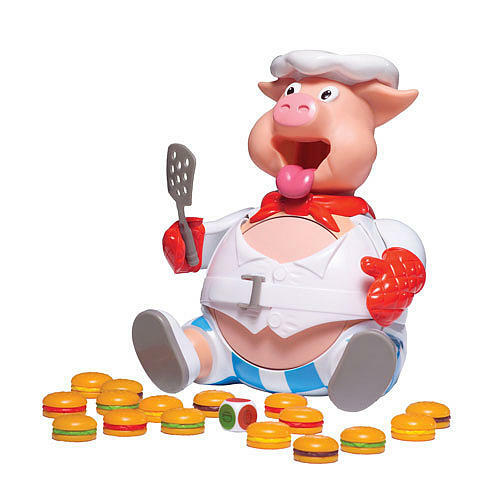 In contrast, “Pop the Pig” makes children complicit in feeding the porcine figure an increasing volume of toy hamburgers, thereby implying that the over consumption of junk or fast food is itself a competitive undertaking. Its central conceit is one that simultaneously promotes a negative view of pigs by portraying them as mindless eating machines, even as it celebrates disordered eating by coaching children into supporting this unhealthy behavior that disassociates the act of eating from the feelings of hunger or satiety. The game also serves as an advertisement for the worst elements of the S.A.D. : junk food. The game enacts the perverse logic of the CAFOs (concentrated animal feed operations) which aim to fatten the animals it houses as much as possible in the minimum amount of time without incurring a loss. The second objection I have to this game is that it promotes fat shaming by the very conceit of having the pig explode due to the constantly expanding size of its belly. This is where the game really becomes obscene: its indulgence in self-hatred. The game associates excessive girth with a gruesome, yet risible death, and thus conditions children to regard obesity and those who suffer from it as a laughingstocks. In a nation suffering the economic, medical, and emotional toll of an obesity epidemic, a game that suggests that the way “we” Americans eat will not only kill us, but render our appetite “animalistic” is both morally repugnant and contemptible. Because the children are the very cause of the pig’s overfeeding, they are also to blame for the harm that befalls it; in short, kids are desensitized to the animal’s suffering, since they are the agents who bring it about. This attitude further dissociates the notion that our food not only comes from, but also is animals, fellow living creatures who feel pain, hunger, and fear and whose environment we have “managed” with increasing callousness as businesses, slaughter houses, and fast food outlets, and supermarket chains all clamor for more and more meat to feed the American appetite for protein. In short, this toy markets self-loathing and fat-shaming to children as a form of entertainment. Its marketers ask parents and children to disown their own hunger and appetites as something shameful (or pig-like), which must be beaten out of us, lest it engulf us in its ceaseless demands and humiliate us with our weakness when we binge. “Pop the Pig” makes me yearn for the toy kitchens and plastic edibles (fruits, vegetables, cartons of milk) which accompanied them not too long ago. It even makes the Easy Oven, with its own reliance on sugar-laden, processed cake mixes, seem downright healthy by comparison, because it at least promoted the healthful habit of home cooking. I have half-a mind to give it a negative review on Yelp, but that site itself has been discredited due to greedy users trying to leverage the power of the digital word for freebies from restaurants trying to maintain their reputations. Oh, well, I guess this blog post alone will have to do.